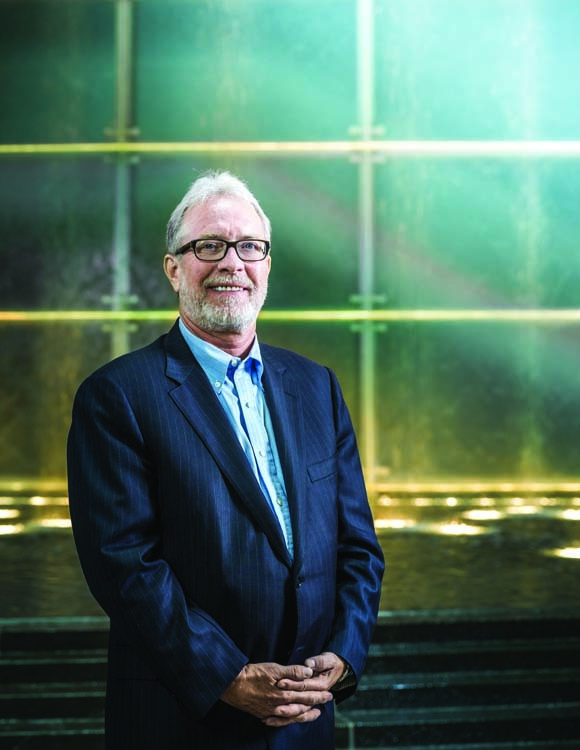 How Detroit-based Meridian Health Plan grew from a small player in the health care sector to a $3-billion powerhouse that operates in 34 states. Imagine the scene: It’s a blustery winter evening in the late 1990s. Snow is pelting down, at least a half-foot is already on the ground, and Dr. David Cotton and his son, Jon, are gamely trudging through the mess, heading for a distant dumpster. Each has a tightly stuffed, oversized plastic bag slung over his shoulder. Just as the pair gets to the dumpster, one of the bags bursts open, its contents scattering everywhere. Father and son are down on the ground quickly, scrambling in the freezing slop, frantically gathering every scrap before it blows away. It turns out Dad was clearly onto something. Cotton is the renowned former specialist-in-chief of obstetrics and gynecology at the Detroit Medical Center, but he gave up that profession to get into the health care business. In 1997, Cotton launched the family-owned Health Plan of Michigan. As usual, he was multitasking on that on that winter evening, and one of his many jobs wa picking up the trash from all the receptacles in the cramped, 1,500-square-foot office in Southfield he shared with two other businesses. Fast-forward to the present. The dumpster and that tiny office space are a distant memory. The headquarters of the Cotton family’s business — employees include David’s wife, Shery, along with Jon and his two brothers, Sean and Michael — is now in downtown Detroit at One Campus Martius (formerly the Compuware Building). Occupying four floors and more than 250,000 square feet of space, what began as Health Plan of Michigan became Meridian Health Plan in 2008. Two years ago, the Cotton family joined Dan Gilbert’s Bedrock Real Estate Services in an acquisition of the 15-story, 1.1-million-square-foot office building. Today, Meridian Health Plan is the largest Medicaid HMO in Michigan and Illinois, serving Medicare and Medicaid patients along with health insurance exchanges that, combined, number more than 850,000 members among 45,000 providers in six states: Michigan, Iowa, Illinois, Indiana, Kentucky, and Ohio. Meanwhile, MeridianRx, the company’s pharmacy benefit manager, provides another 1 million health plan members with a prescription network across 34 states, making it the 15th largest such entity in the country. All told, Meridian Health Plan generates more than $3 billion in annual revenue and has more than 1,800 employees; nearly 85 percent of them are based in Detroit. It’s been a long while since David Cotton went dumpster-diving, but both he and Shery clearly delight in recalling those early days, fraught with equal measures of panic and exhilaration, as the pair took the risky plunge and a dream was launched, initially around the kitchen table at the family’s home in Grosse Pointe Park. Cotton’s vision for delivering a superior health coverage program was largely inspired by what he was observing every day in his practice at an inner-city hospital: The vast majority of his patients were showing up for deliveries with virtually no prenatal care. The second phase concentrated on the patients. Cotton set the bar high. His goal was to find those people who needed the most care, then “Give them that care, and keep them healthy and out of the hospital, so people are going to be shocked this is an HMO,” he says. “Everyone associates an HMO with denial of care. Somehow the Cottons survived, and in late 1996 they bought the health plan of a small clinic in Jackson County, along with what turned out to be hundreds of thousands of dollars in unpaid pharmacy and medical claims. Another significant milestone came in early 2000. By 2008, the company had grown to 112 employees, with annual revenue of $275 million. Since late 2013, annual revenue has jumped to $3 billion from $1 billion. Jon, 38, is president and COO of the Michigan operations. His twin brother, Sean, is president of Meridian Technologies, where he oversees human resources and IT, and 35-year-old Michael is the COO and an executive vice president. Jon says the company’s reputation is everything. “That’s all we have,” he says. “We’re not a $100-billion United Healthcare that can buy up a market and sustain losses for years and years to buy members. That’s not us. We’re family-owned, we live and breathe quality, we do it better than anyone else, and we stop at nothing to do whatever it costs and whatever it takes. Even as it has grown exponentially beyond its home state, Meridian strives to retain the same family feeling that was shared around the kitchen table at the very beginning. Last year Meridian increased its minimum wage to $17 an hour, which applies to about 30 percent of its workforce. Everyone else makes more. It’s an enticing incentive, to be sure, but it’s not for just anybody. The Cottons readily concede there’s a certain prerequisite for loyalty to the company’s culture. The family’s vision for the company is bullish: By 2020, they project annual revenue to increase to $5 billion, and they anticipate the number of employees will double, to between 3,000 and 4,000. As the company grows, the same 85 percent ratio of employees based in Detroit is expected to hold steady. They initially moved into a space at 777 Woodward Ave., where they still occupy three floors — and it’s right across the street from their new headquarters. That same year, the family turned its attention to a disturbing situation that was taking place in their home city. 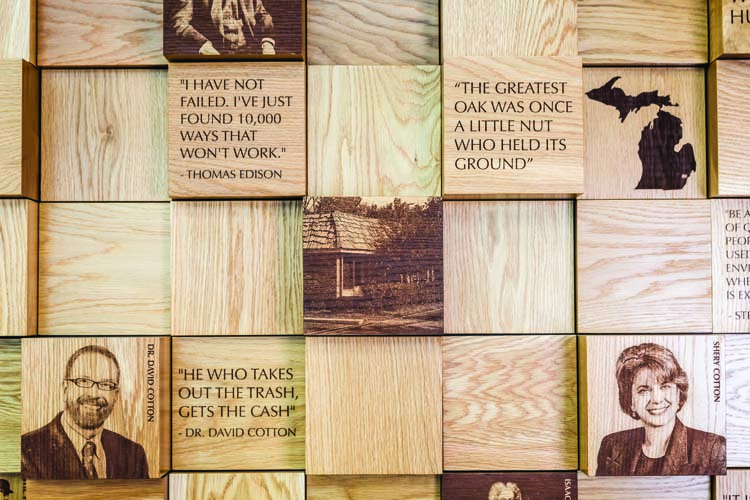 an inspiration wall crafted from etched wood at meridian health Plan’s headquarters in downtown detroit. The Cottons parlayed that investment into a reclamation project, creating not only refurbished rental properties but also the family’s Grosse Pointe Housing Foundation, which pays half the rent for 100 students and residents living in the units. Occupancy is near capacity, and there’s a waiting list for applicants who’ve been approved and want to move in. The family has also invested in commercial real estate in their hometown, including two restaurants along Kercheval Avenue — Red Crown and Atwater in the Park. And then there’s the Detroit Crime Commission. Organized by the Cottons in 2011 as a tax-exempt public organization, the DCC operates as an ally of law enforcement agencies in southeast Michigan. Jon has a ready explanation for the reason behind its existence: “My father always wanted to be in the CIA,” he says, with a laugh. The truth of the story is that it all began because of a check fraud scam at Meridian. “That’s when we kinda lost it,” Jon says. “So we … (decided) to create this entity that does this kind of stuff, works with the right agencies, and then passes it off and all they have to do is prosecute,” Jon says. For Jon in particular, it’s been a remarkable journey from that bitter evening huddled next to the dumpster with his dad to where he and his family are now: Community leaders in business, real estate, public affairs, and philanthropy.